Kyocera and API Cryptek, a leading provider of secure networking products and solutions, offer complete device locking security capabilities through API Cryptek’s Netgard™ MFD card reader appliance for select Kyocera multifunctional products (MFPs). 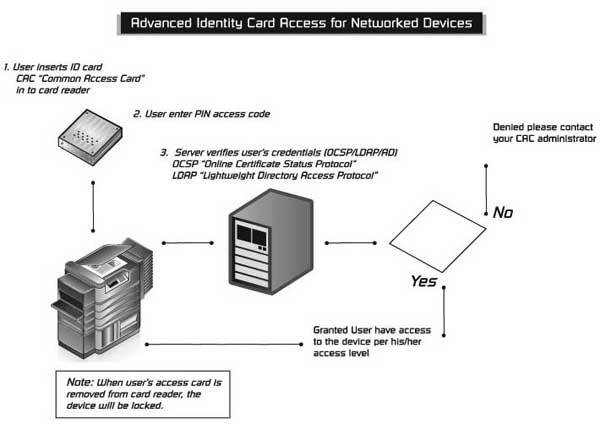 End users who wish to access standard full functions of a Kyocera MFP, including copy, scan, e-mail and fax, will be required to authenticate with their U.S. Department of Defense-issued CAC/PIV Card (Common Access Card/Personal Identity Verification) and their personal identification number (PIN) via API Cryptek’s Netgard MFD. With this advanced security in place, Kyocera MFPs are securely locked from performing tasks until the user has been successfully identified. Utilizing the Netgard MFD with Kyocera’s MFPs effectively secures the device and prevents unauthorized users from accessing privileged materials or tampering with network resources.